Unused EQ Boards With Toggle And Rotary Switches For UA LA-610 Preamp. New UA LA-610 Replacement RIght Side Front Panel w/Peak Reduction, Gain Etc. 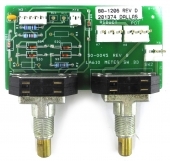 New Replacement Meter Switch PCB Board For UA LA-610 Preamp, P/N 80-1206 / 50-0045. New 90 Degree PCB Mount Large Bat DPDT Toggle Switch For Various UA Models. New UA LA-610 Replacement Left Side Front Panel w/Level, Gain, EQ Etc. New 90 Degree PCB Mount Small Bat DPDT 1/4" Toggle Switch For Various UA Models. 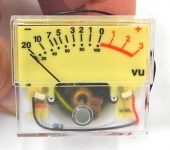 New Replacement VU Meter For All Versions Of UA LA-610 Channel Strip. New Replacement Red Pilot Lamp Jewel For US Gear, P/N 30-0025. Lot 40 Pieces, White Pilot Lamp Jewel For UA And Other Gear, P/N 30-0025. Includes mounting hardware.